Background radiation is the natural radiation we get by living on Earth. There are many naturally occurring radioactive isotopes which decay over time. They release radioactive particles or radiation into the surroundings. We call this "background radiation". 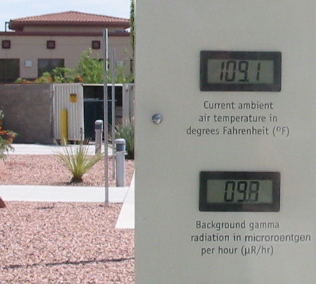 The biggest source of natural background radiation is radon in the air. This radioactive gas comes from the ground. 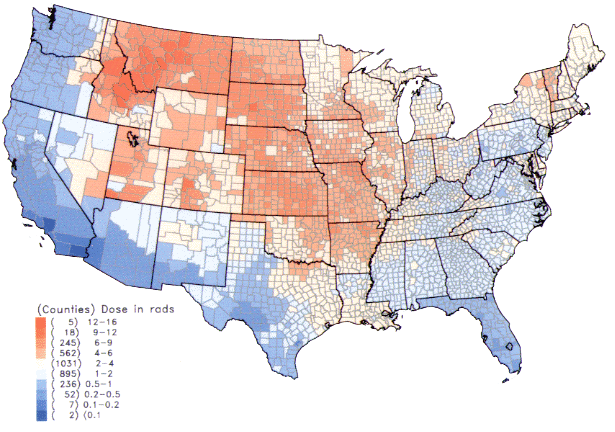 Radon and its isotopes, parent radionuclides, and decay products make up most of the radiation we get. Radioactive material is found throughout nature. It occurs naturally in soil, rocks, water, air, and vegetation, from which it is taken into the body. Humans also get radiation from radioactive materials outside the body and from cosmic radiation from space. The worldwide average natural dose to humans is about 2.4 millisievert (mSv) per year. This is four times the worldwide average artificial radiation exposure, which in 2008 amounted to about 0.6 mSv per year. In addition there are X-rays and other forms of medical imaging. In Europe, average natural background exposure by country ranges from under 2 mSv annually in the United Kingdom to more than 7 mSv annually for some groups of people in Finland. Background radiation Facts for Kids. Kiddle Encyclopedia.